Pokemon Go is one of the most popular games which do not need any introduction. This game is being played by many, and so there are many issues. One of the most common problems being faced by many of the players is not logging into Pokemon Go account. Many users are facing problem logging into Pokemon Trainer Club or Google Account. Pokemon servers are going down as many users are trying to connect to the account and it has brought down the working capacity of the Pokemon Go servers. In this article, I will let you know the fix for Pokemon Go not logging in problem. You can download Pokemon Go latest version. Read, Pokemon Go Tips & Tricks. Pokemon servers are going down as many users are trying to log in to the account and it has brought down the working capacity of the Pokemon Go servers. 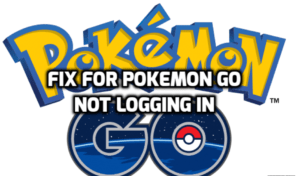 In this article, I will let you know the fix for Pokemon Go not logging in problem. When you open the Pokemon Go app after installing it, then it would ask for login using Pokemon Trainer Club (PTC) or Google Account. When you choose one account, then it would show spinning Pokeball which says that it is waiting for the server. When the server is not accessible, Pokeball keeps on spinning and at last it says that you are not able to log in. Select Accounts from the list. Go for Sign-in and Security. Select Device Access and Notifications. Now, remove the device which you cannot log in. Open the Pokemon Go and now it asks for login using Google Account. Useful Sources for Pokemon Go Lovers: PokeVision App, PokeRadar App, and Fix for Pokemon Go Camera Orientation Problem. These steps should work fine to log in using Google Account in Pokemon Go. If you are facing the login problem into Google account, then above mentioned steps would solve the problem and if you still face the problem, then let us know through comments. Logging in to Google Account is preferable than logging into Pokemon Trainer Club as Google servers seem to be stable. I have tried to use the fix on my android phone Samsung 6. Still did not work for me. Still stuck on Google sign in. I click Google, it ask for birthday then select email address. I’m in a never ending loop. Please help. I have no problem signing in on my iPad the same way so I can’t figure out why not working on android. I have the latest updates for phone which is 6.0 . Only have one option when downloading pokemon go plus from app store. Out of options.